← WOW … 2013 Our Blog Stats — Thanks Everyone !! Welcome to our Monthly review video where we look back each month and highlight important items and MAYBE few crumbs the crowd missed. Vimeo if all all else fails. In surprise move the FOMC zigged a little and threw the street off (present party included) by slowing the asset purchases by $10 billion monthly in December. Our thinking was skeptical of this move due to the Bernanke sunset term (Janet Yellen takes over in late January) and the moderate economic numbers. No matter the reason, we are very happy at the move as were market participants. Recall the FOMC had instated a $85 billion monthly asset purchase to artificially lower longer term interest rates in order to stimulate the economy, especially housing. Their announcement included not only at $10 billion trim of asset purchases to $75 billion monthly but also the vague intent to continue the declined purchases at each of the FOMC meetings in 2014, thereby being completely out of the asset purchase game by year-end 2014 …. if all goes well. Horaay we say as we have desired this slowing of stimulus for some time. 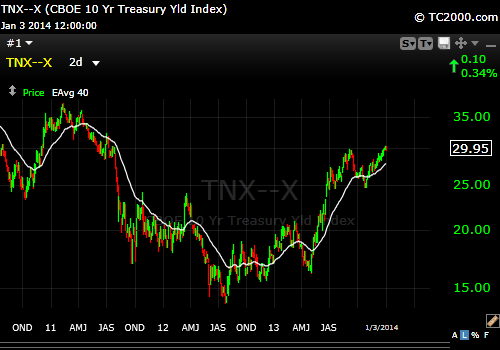 All eyes including ours will be watching the 10 year treasury rate (below, a multi-year chart of 10 year treasury), mortgage-backed security rates and Municipal Bond rates. We desire a smooth increase, of course markets can be vicious, so outcomes may be different…. So Far so good! There is nothing more that can be said about much of 2013 other than, not too hot, not too cold….just perfect….Oh I am sorry that is little Red Riding Hood…well the shoe may fit. 2013 may go down as the Goldilocks, Little Red Riding Hood year in many books with December capping off a sugary ice cream topping desert year. 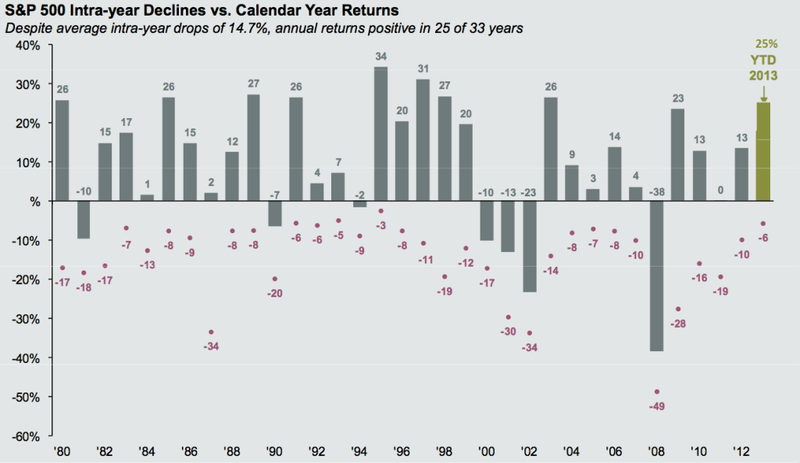 Not to steal too much from our pending Newsletter, but 2013 was a VERY friendly equity capital market. Unfortunately it just does not always work that way. Sometimes it giveth and often times it taketh…. Attached is a chart showing the draw downs annually. Notice how small 2013 was/is. As we say goodbye to 2013 and especially December, we wanted to re-iterate the MOST important item in investing in the current economic and political condition is to stay diversified. While we lean in certain directions, we always recommend a toe in most collective investment waters for safety, participation and good long-term outcomes. 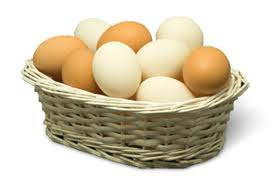 It is never a good idea to have all our collective chickens in one basket! This entry was posted in General Financial Planning, Investing/Financial Planning, Market Comments, Video and tagged 10 Year Treasury, Bernanke, Goldilocks, Janet Yellen, MBS, Mortgage Backed Securities, Muni Bond Rates, Red Riding Hood. Bookmark the permalink.